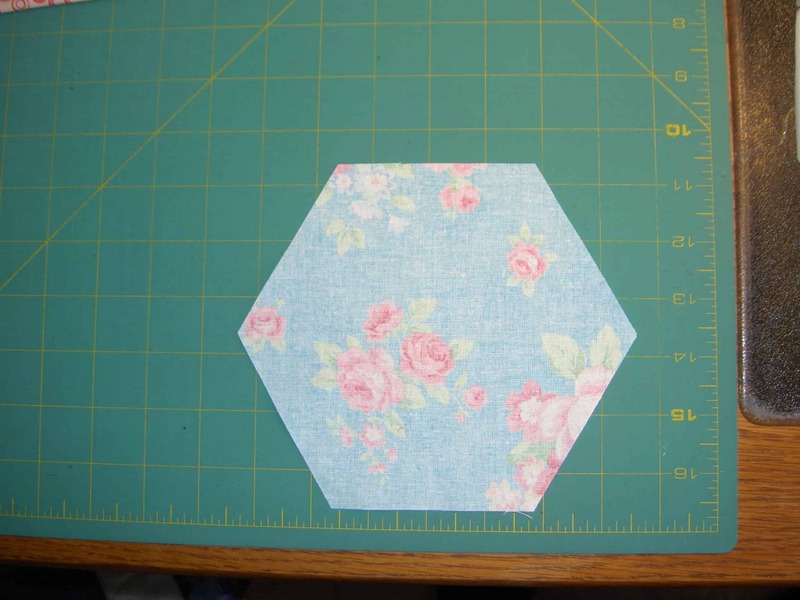 Did you follow the directions for cutting your hexagons? Did you watch the video? If so, you are ready to prepare to piece. If not, you can find the directions and information on my previous post. Note: my hexagons are 7″ unfinished. 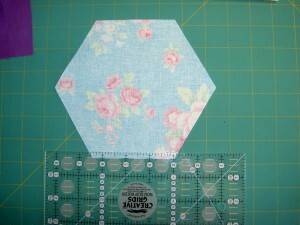 We are preparing to machine sew the hexagons using Y seams. Leave your fear of Y seams at the door, please. This is a relatively quick method after you do the step outlined below. However, you won’t be able to chain piece. 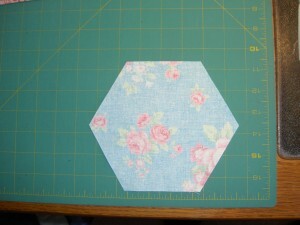 You will be working on the wrong side of your hexagons at first. The photo of my piece (above) is similar to what your goal should be. Note that the piece I show is not the final product. I don’t know how large my final quilt will be. That is just how I roll on certain projects. You should check Sandy’s blog and podcast as she has provided some information about sizes and amounts of fabric. 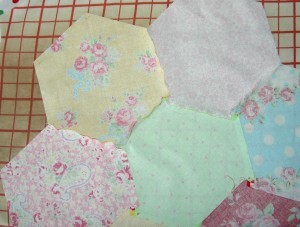 I don’t think in rows, so I don’t always sew in rows (remember the Chunking it tutorial?). This project lends itself to sewing in a circle, which I find very calming. Take your cut hexagons and turn them right side down (wrong side up) on a surface you can draw on. I do this step right next to my sewing machine just before I sew. Take your rotary ruler and position the edge a quarter inch from one edge. For example, pretend you were going to slice off a quarter inch and position your ruler that way. Note there is no rotary cutter on the supply list so no cutting, please. The goal is to end up with an X at the 60 degree angle spot on the patch. On the wrong side of your fabric, take your pen and draw a light line where a quarter of an inch should be. 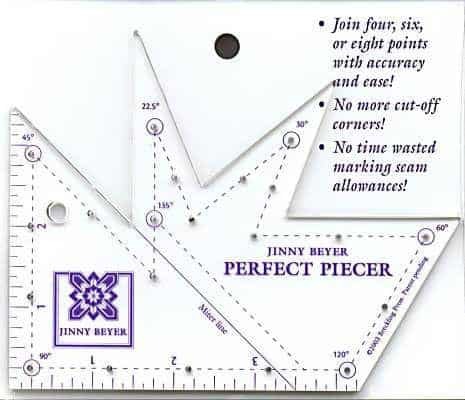 You won’t see it on the front if you are careful, so using one of the pens mentioned above is ok. You will be doing this at the 60 degree angle/where the corner of the patch is, if the patch had a corner. When you mark the second side, you will have one X and 2 lines. Do the same thing at each of the other angles. 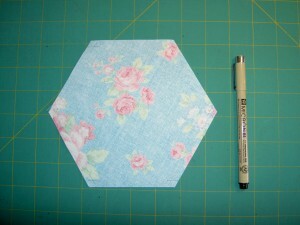 If you draw lines all the way around so you have little X-es at every angle of your hexagon. No groaning. I didn’t promise this would be a fast project, but it also doesn’t take that much time. If you are rolling your eyes, go buy the American Patchwork and Quilting magazine, because they have a method of doing this piecing in rows. 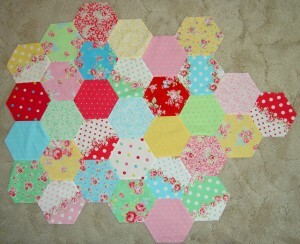 Seems everyone is on the Hexagon bandwagon these days. If the above process is just too horrendous for you to contemplate, consider the Perfect Piecer by Jinny Beyer. 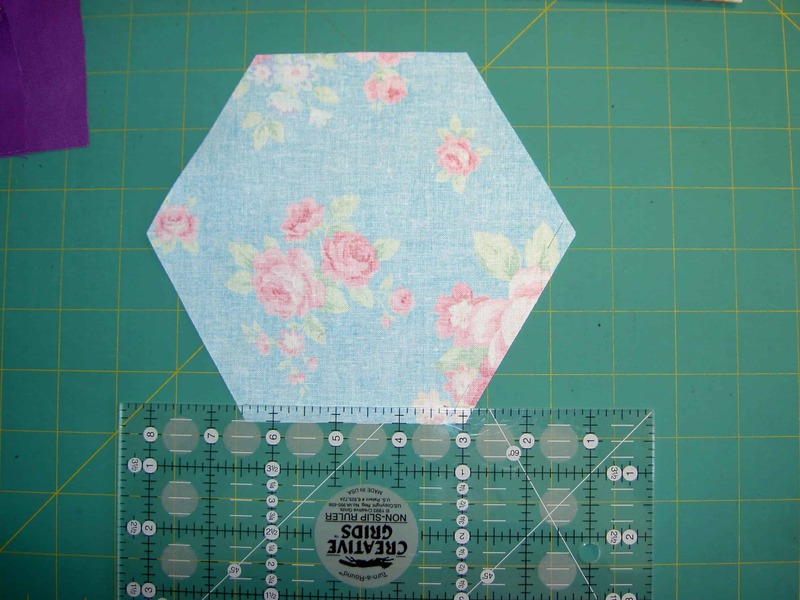 The 60 degree angle on the right side is perfect for making dots (not X-es) which you can use to sew between. Those circles are actual holes through which you can mark. I bought this to use for my Flowering Snowball and realized it would work with this project as well. I pushed the Sewline pencil lead way out of the pencil and was able to use it with this ruler. Once you have done the marking, go to your sewing machine. Do all the normal thread and needle checking stuff necessary for your machine. Put your machine on the setting for stopping with the needle down. 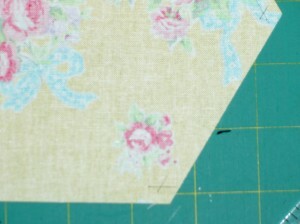 If you don’t have a needle down setting, adjust your sewing so you can stop with the needle down. This isn’t an absolute must, but really helps. 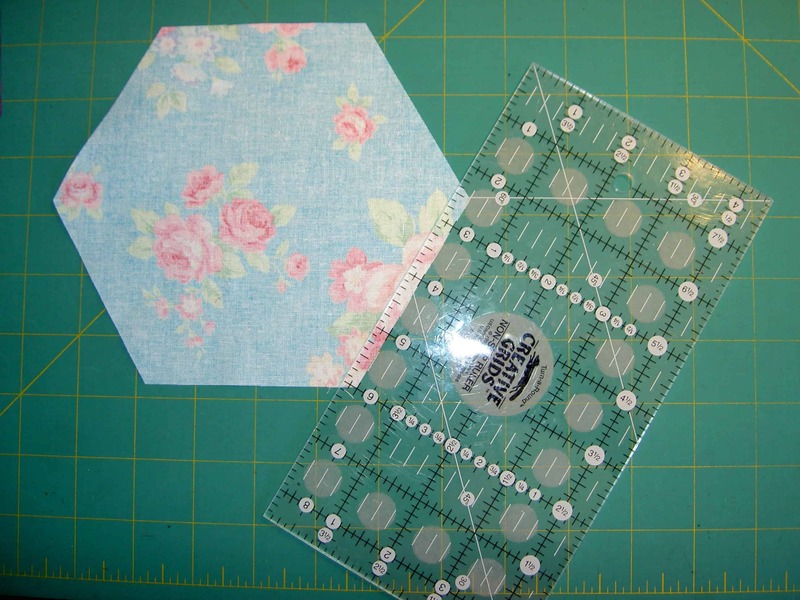 Position the needle right above the intersection of the x. Sew into the intersection of the X and sew all the way across using your quarter inch foot. STOP at the intersection of the second X. Do NOT sew into the seam allowance. Backstitch a couple of times. I backstitch, because there are no seams crossing one another. Remedy for sewing into the seam allowance: rip out the number of stitches into the seam allowance. Don’t rip out the whole seam, just rip out the stitch or two that went over. 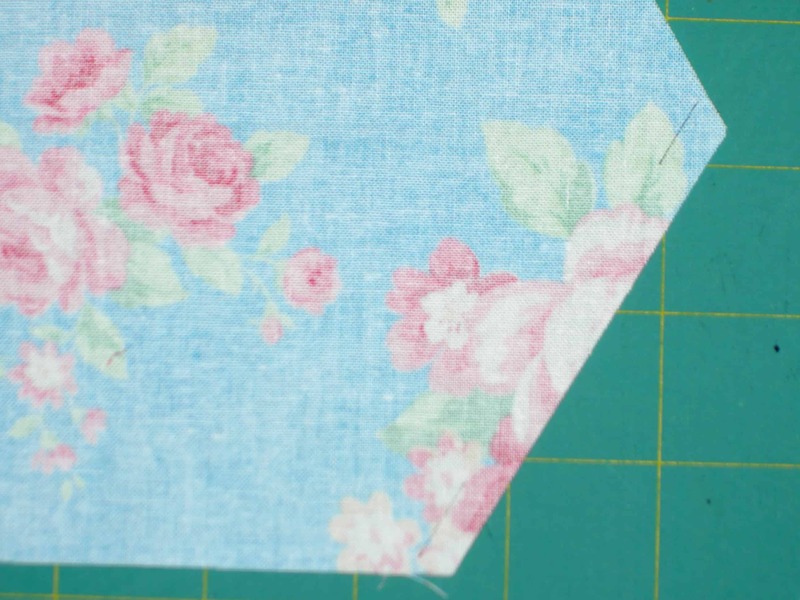 Take the piece out of the machine and reposition the next unsewn side.Same deal: Position the needle right above the intersection of the x. Sew into the intersection of the X and sew all the way across using your quarter inch foot. STOP at the intersection of the second X. Do NOT sew into the seam allowance. Backstitch a couple of times. Take your piece over to the ironing board and lay it face down. Yes, I know everyone says to press right sides up. Not this time, sweetie. Face down. On the ironing board. You are going to make a swirl with the seams near each other. Look for how the other seams connected to the new ones you just sewed are pressed and press the new ones in the same direction. If you follow these directions, you will get a little flower at the intersections of the seams. That is why you don’t sew into the seam allowance. 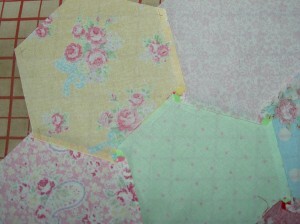 The quilt will lay flatter and the seams will be in order. You see a slightly different method at the Blue Chair blog. 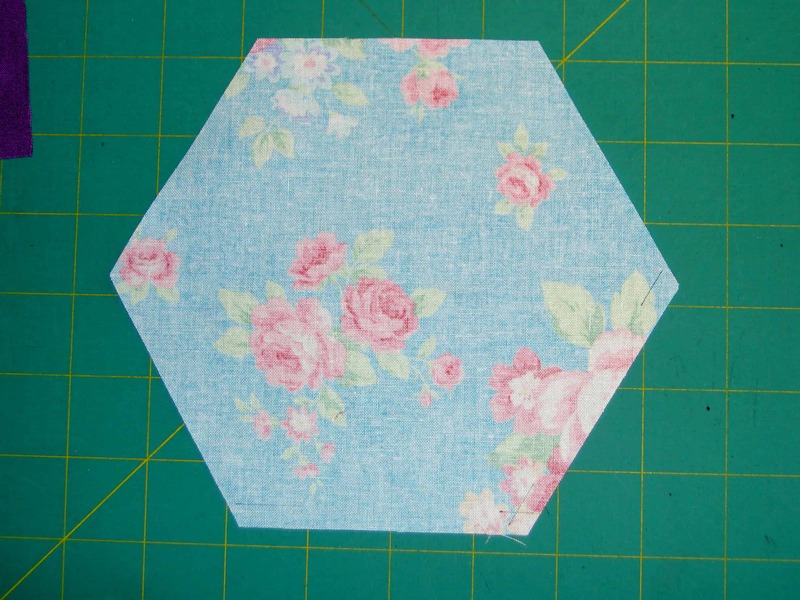 OK–you said sewing in a circle. What order do you do the seams, then? 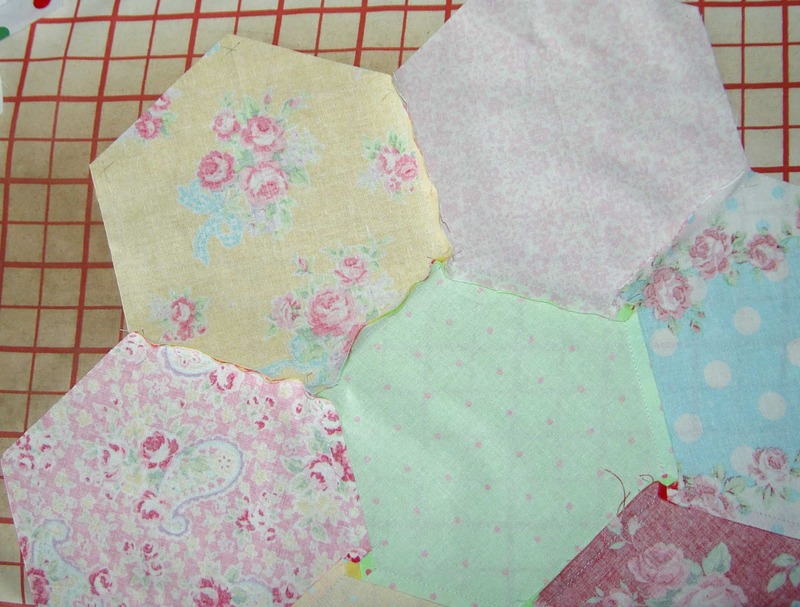 Sew piece 1 (center hexie) to piece 2, then piece 1 (center) to piece 3, then adjoining seams of 2 and 3? 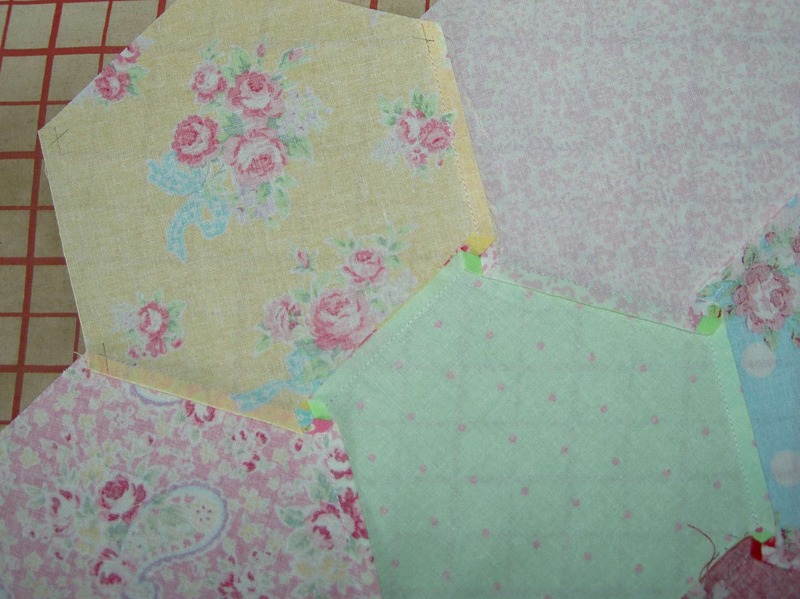 I’m not positive I’d be able to keep track of my design if I sew in circles/chunks rather than rows. It’s sort of a mosaic-y thing. Once I get everything laid out, I’ll be able to tell better. It’s not a problem with method, just me knowing how best to make sure I get pieces in the right place!